A short hairstyle with a long fringe can be so face-flattering and easy-to-style on straight hair, you’ll wish you’d gone short years ago! I do believe there’s nothing so relaxing as waking up without having to face a lengthy session with hair-drier and brush before you go to work! 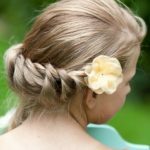 This simple short cut is easy to style with a little wax or moulding cream. Pixie cuts are great for thin or fine hair, with plenty of layers that create shape, lightness and texture you’ll love! 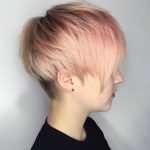 This contemporary, long pixie-cut has the latest forward-combed top and swept-over fringe, with wispy tips that keep the look soft and feminine. Add a touch of styling wax and then use your fingers to create the definition and wavy texture that accentuates the lively movement. A lightly curved fringe on a short haircut makes a very attractive frame for the upper face, drawing attention away from any downward lines and covering a lined forehead beautifully! If you hair is very fine, but in healthy condition, highlights are a very effective way to thicken the hair strands and create a some extra ‘depth’ through the colour contrast with darker roots! This cute short hair style is great for round, oval, heart, and triangular face shapes. If you don’t like this cut, just check out the homepage on hairstyles weekly to find more latest hairstyles.